To bring a custom-designed aquarium or living reef into your home is to enter a new world of beauty, elegance, and fascination. No family member or guest, young or old, will be able to resist the wonder of this living spectacle that glows with color and evolves constantly. Our skilled designers will build your aquatic installation to your specifications, working with your preferred style, and using the aquarium and cabinetry materials that are best and most appropriate for your particular space. We'll work with you, your interior designer, or your architect to ensure that your aquarium or living reef perfectly enhances your home's décor. We can also beautify your grounds with an attractive pond stocked with fish, an exquisite fountain, or a unique waterfall that will be an oasis of peace and joy for you, your family, and your friends. And of course we'll be available to help you maintain both your interior and exterior installations. Comment: Beautify your home with Home Aquarium.. Comment: fish tank makes us a whole day happy and free from mental tension. A marine aquarium is an aquarium that keeps marine plants and animals in a contained environment. A stable marine aquarium requires more equipment than freshwater systems, and generally requires more stringent water quality monitoring. The inhabitants of saltwater aquariums are usually much more spectacular than freshwater aquarium fish. Usually temprature kept between 24 to 28 degrees Celsius (76-82 F), Specific gravity, a relative measure of water density, is normally maintained between 1.020 and 1.024 in aquariums with fish only, and 1.023 and 1.026 for aquariums containing invertebrates. Salinity should therefore be between 28 and 35 PPT, with the higher values being beneficial in advanced reef systems. Because salinity is by definition directly related to specific gravity, both can be tested with an inexpensive hydrometer or refractometer. pH should be maintained between 8.1 and 8.2. Carbonate hardness (KH) should be between 8 and 12 degrees. A calibrated calcium reactor can assist in maintaining both pH and carbonate hardness. Using purified water from a reverse osmosis / deionization (RO/DI) unit can prevent KH and pH fluctuation. Marine aquarium need strong filtration requirements than freshwater aquariums. The various components frequently include Wet and dry filters and Protein skimmers. Protein skimmers are devices that remove organic compounds prior to their degradation, and are also very useful in marine aquariums. Due to the scattering of light in water, the deeper one s tank is, the more powerful the lighting required. Color temperature, measured in kelvin Light from the sun has a color temperature of approximately 5900 K and lighting systems with color temperatures >5000 K tend to be best for growing plants in both the marine and freshwater setting. 10,000 K light appears bluish-white and emphasizes coloration in fishes and corals. Higher up on the spectrum there are 14,000 K and 20,000 K bulbs that produce a deep blue tint which mimic the lighting conditions underseas, creating an optimal ambience for invertebrates and livestock present. We, Aquarium Design India understand the concept of how the marine eco-system function . Hence, taking into considerations like water circulation and rock structures (cliffs, ridges and crevices), we strive to achieve a more natural look, giving a more oceanic feel for your aquarium. We are engaged in offering an exquisite range of Marine Aquarium, which is designed with perfection that carries a mesmerizing appeal. Our range is so innovative in design and color combination that these are source of enjoyment. The wide range of Marine Aquarium offered by us includes Home, Hotel, Office, Shopping Malls, Hospitals, Education institution, etc... Our professionals keep close coordination with the customers while designing Marine Aquarium to understand the likeness of customer to work for the complete satisfaction. 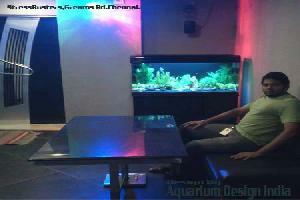 Keywords : Residential Aquarium in chennai, Marine Aquarium in chennai,Home aquarium in chennai,aquarium chennai,chennai aquarium, Proffessional Aquarium Designer in chennai,marine Fishes in chennai,marine aquarium Maintenance in chennai,Marine aquarium Filters chennai,Aquarium Accesseries chennai,Marine aquarium display in chennai,Marine gallary chennai. Featuring live plants in your aquarium not only makes it more attractive, but is much healthier for your aquarium s inhabitants. Live plants provide your fish a natural food source with the ability to replenish. By far the biggest benefit that live plants provide for your aquarium is that they produce oxygen (O2) and absorb the carbon dioxide (CO2) and ammonia (NH3) that your fish generate. Live Plants in your aquarium mimic the natural ecosystem, and may be one of the most beneficial ways to keep your fish healthy. When first beginning to use live plants in your aquarium, it is wise to choose a large amount of hardy species Once your aquarium is balanced, you can start including the more sensitive plant species. To create a natural-looking garden aquarium, add a broad variety of plant species. The visual effect is lush and beautiful. While foreground and background plants help define your composition, don t necessarily place only tall plants in back and short in front. Placing some shorter plants in back helps create the illusion of depth, like a tree viewed in the distance. Don t forget the reds! A bold splash of a red against varied shades of green creates a dramatic visual focus. Red varieties of Ludwigia and Rotala make great choices. Caring for your maturing planted aquarium is both an art and a science. With the right technique and a creative eye, you too can enjoy the rewards of a beautifully sculpted garden. Tall stem plants like Rotala Indica will begin to bend over at the surface if not pruned back. While this surface growth is ideal for bubble-nesting gouramis, it also shades the plants below from precious light. Advantageous rooting plants can be pruned mid stem and replanted. Simply trim the bottom leaves of the cutting and place back into the substrate, using bendable plant weights if necessary to anchor. Replant with the same grouping for a fuller look, or experiment by interspersing these single cuttings among other established groupings. Sometimes, a young plant that starts out looking fine in one location soon outgrows its space. To thin out, either cut and toss individual leaves or carefully pull out half the cluster by the roots and replant the extra in another location. Regular pruning of tall background plants and the thinning out of mid- and foreground plants will provide your aquarium with a defined and clean composition. It s the hobbyist s pleasure to watch nature grow wild in this small world we tend to, always pruning, shaping, clipping, and replanting for new roots to take hold. Comment: it look my dream aquarium, what are the chances of i having it and at what budget ? We aquarium Design India is the creator of contemprary style aquarium.Driven by our passion for aquatic life, We are in constant search of innovative way to capture the wonder of the aquatic world while striving for a balance between aethetics and practicality. The Slim Picture Frame Aquarium is a dramatic and eye-catching addition to any room. Flush mounted as standard, the Picture Frame Fish Tank can be adapted to be In-Wall,At Aquarium design India, we have a great selection of decorative wall-mounted aquariums that can turn any room into an art gallery. you can own an eye-catching, wall-mounted fish tank that will highlight and enhance any home or office. These state-of-the-art Plasma Picture Frame Aquarium take up less space than conventional freshwater fish tanks and much easier to maintain. All of our plasma-mounted aquariums are sleek, stylish and seductive. These new sleekly-designed aquariums are beautiful to behold and will make any room look fabulous and save you valuable space! These stunning suspended aquariums wouldn t be out of place in a modern art museum. These wall mounted aquariums will add an atmosphere of life and sophistication . As the tank is fully mounted on the wall, there s no need for a stand or table, thus drawing the eye directly to the tank. The low profile of these aquariums match the modern look of plasma TV units. They can be mounted at any height keeping them at eye level and away from small pets. All necessary equipment is included and fully integrated behind the frame, leaving nothing but the natural beauty of the fish and water for the viewer. At Living Pictures Wall Mounted Photo Frame Aquariums that s exactly what we provide. A unique and beautiful way to decorate your home or office with a live underwater environment. Aquariums that hang on your wall like a painting, yet brings vibrant, colorful life to any living style. Bring beauty and life to your walls with an exquisite See-Through wall aquarium. An aquarium that is literally built into the wall or an aquarium that serves as a room divider is See-Through Aquarium. This type of aquarium is custom built to fit your space. It s a great way to section of a room but because you can see through it, it still gives a feeling of openness.It s beautiful and striking, catching the eye as you walk in the room. These See-Through wall aquariums look stunning just about anywhere from homes to offices, hotels, and hospitals. They create instant serenity in just about every setting. The exquisite range of See through Aquarium offered by us is designed at par with the latest market trends. We offer this aquarium in various capacities, designs and sizes as per the requirements of our valued clients. Since these tanks become the focal point of a room it will be very important to keep them healthy and clean. It you feel you re not up for the task then you can call us for maintenance work for your tank. Keywords : Residential Aquarium, See-Through Aquarium designer in chennai, Home aquarium designer chennai,partion aquarium,Hall divider aquarium chennai..
A floor aquarium can be both an attractive piece of furniture and an asset to your tropical fish hobby Designed at par with latest market trends,..
By building the tank on the floor, you can avoid investing in a traditional aquarium. This are a perfect piece of art work and known as small piece of the ocean at home. High-end design and ease-of-maintenance blend seamlessly into your lifestyle. This stylish professional aquarium system elevates form and function to the next level. Beautiful frame less Acrylic aquarium boasts an unique shape to enhance the view from all angles. The result is a spectacular, eye-catching addition to enjoy at home or office. Completely hidden filtration system employs mechanical, chemical, and biological filtration PLUS a venture protein skimmer for efficient 4-stage filtration. This superior filtration system means a healthy environment for aquarium inhabitants with minimal effort. The Floor Aquarium System lets you explore your creative side whether you desire a marine or freshwater setup. Finishing your floor Aquarium with wood trim will complete the custom look. Keywords : Residential Aquarium, Piller Aquarium.